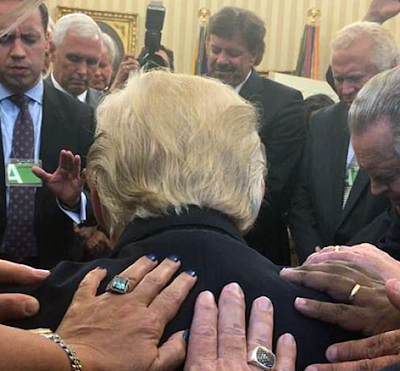 A photo showing evangelical pastors and leaders praying and laying hands on President Donald Trump has drawn criticism. In a photo posted online today. Trump bows his head as evangelical leaders lay hands on him in the Oval Office. The photos were taken in the White House on Tuesday, it has been claimed. Trump has remained out of the public eye since returning from the G20 summit in Hamburg, Germany over the weekend. The photo, taken by Rodney Howard-Browne, has been shared many times on Facebook.com, Twitter.com, and other social media outlets. The photo sparked criticism among the heathens on Twitter.com. But not everyone was critical of the images.